One thing that love about Winter is the snow. Granted I don't want a ton of snow all Winter long, but a few big snow falls are wonderful. I love you can go the bed at night, sometimes, and wake up the next morning to a blanket of snow covering everything. It is like the world (or at least the part of it I can see) has had a complete transformation or makeover over night. After a big snow fall one, we get all bundled up and head out into the snow. 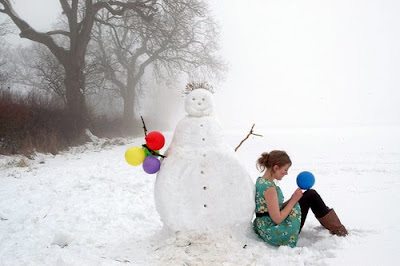 We love to make snowmen. Ours never look as good as the ones you see on tv or in the movies, but we have a blast making them! We roll up our huge snow balls and we always have a little bit of difficult getting them stacked on top one another. After the snow body is complete we add in the details so that we have a real snowman in our yard. But your snowman doesn't have to be big. Aren't these little miniature snowmen so adorable? And isn't this photo so cute? It looks like the bird is giving the little snowman a kiss on the top of the head! 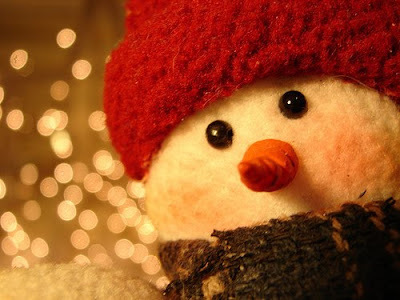 Not only do we love making snowmen, they are one of our favorite Winter decorations. We have a snowman family that sits on our coffee table all winter long and a snowman wreath on our door during the winter. 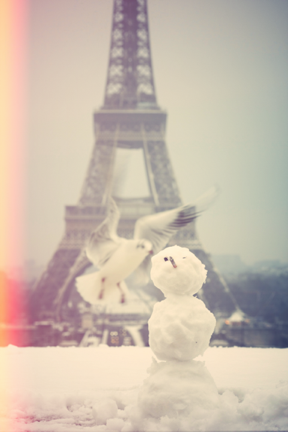 I love snowman. I miss not have snow in the winter but I do love that I'm able to wear my flip flop all year around. 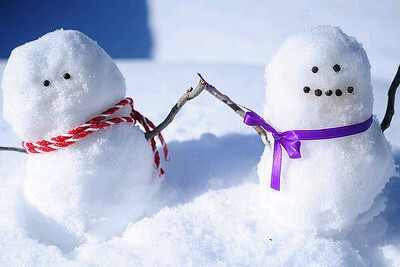 These are the cutest snowman pictures! !